Our TV viewing habits are changing. Streaming services such as Netflix are enormously popular and millions of us take advantage of catch-up TV from iPlayer, All4 and many others. In fact if you’re happy to rely on catch-up and streaming entirely you don’t need to pay for a TV licence, saving a cool £145 a year. This has not gone unnoticed by the BBC. It has been looking at ways to plug the ‘iPlayer loophole’ for some time, and a decision has now been reached. From the 1st of September a TV licence will be required to use iPlayer regardless of whether you’re watching live or catch-up. Failure to pay can result in a fine of up to £1,000 (£2,000 in Guernsey). The TV licence requirement applies no matter how you access iPlayer, so as well as the web interface it will impact anyone who uses a games console, streaming box, smart TV, smartphone, tablet or any other device. However, according to a poll we recently conducted most people are unaware of the impending change. 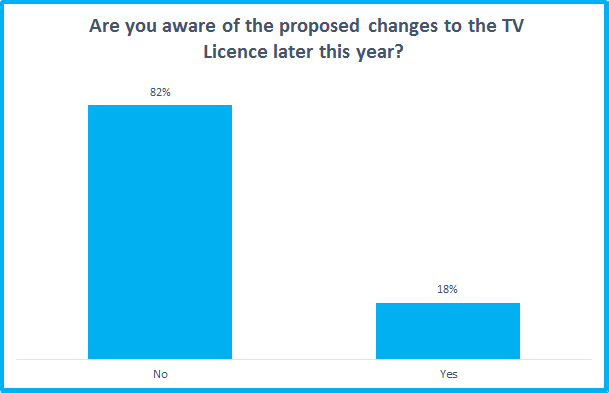 Of the 1000 respondents an overwhelming majority of 82% said they did not previously know about the forthcoming requirement for a license to use iPlayer. More than 25 million licences were issued in 2015 so most households will already be covered, but that still leaves a potentially large number of iPlayer users who could be liable for a fine. For the moment though the BBC does not appear to be enforcing the licence by asking for a login, or otherwise linking iPlayer viewing data to paying households. While there are no technical barriers to stop them doing this, such a move is viewed as a slippery slope that will inevitably lead to a subscription based BBC. And that's something the corporation believes would not be in the best interests of itself or its viewers.